There's a new WeMo Light Switch at CES 2019, and it's a smart home gadget that you might have expected Belkin to introduce a long time ago. It's a simple switch that replaces your dumb light switch and allows you to control your home lights in a variety of ways: through the wall, your phone, or via Siri. This one has native HomeKit compatibility, which is a big plus for iOS 12 users, and it doesn't require the old WeMo bridge to work with Apple's ecosystem. What's interesting is that the WeMo brand already has a more expensive dimmer switch (WeMo Dimmer), smart plugs (WeMo Mini Smart Plug), and even individual LED smart light bulbs. 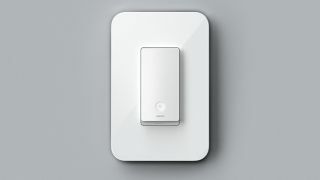 But there's been no simple bridge-less WeMo light switch. That all changes here at CES 2019. The WeMo Light Switch price ranges from $39.99 for a single-pole switch to $49.99 for a three-way switch, depending on your current light switch electrical setup. There's no price attached to a release in the UK, Australia, or other regions just yet. What's the difference? If you have two or more light switches controlling a single light right now, you'll need the three-way switch. If not, stick with the standard single-pole version and save yourself money. This affordable price gives you a cheaper option for a bridge-less switch next to the more expensive WeMo Dimmer, and if you're outfitting your whole budding smart home with smart switches, this is the one to get in bulk. Save the dimmer for your main room. Belkin is launching its new switch in spring or summer of 2019, and we'll have more hands-on time with the HomeKit-compatible WeMo Light Switch at CES 2019.